With the holiday season in full swing and a new year right around the corner, students all across the world are preparing for this season that entails more than stressing about the perfect Christmas gifts or how to prioritize between ugly sweater parties and decking the halls. High school and college seniors around the country have one thing on their mind as they cram for their last finals and prepare for college and graduate school visits. GRADUATION! For some, they worry if they will even graduate or begrudgingly return to campus for an additional semester. Others debate whether they will move onto their bachelors or graduate degree, or enter corporate America. The choices this time of year are already overwhelming in addition to those you are faced with regarding your future! In a day and age where students are graduating with an average total debt of $27,667, it’s no surprise your profound sense of responsibility in making those big decisions. What is the biggest deciding factor in many of these decisions? Simply stated, most of these choices revolve around the availability of funds or the drive to start pursuing a better financial future. While some may argue that success can be found without a degree, we here believe that everyone pursuing success should have the opportunity of higher education available and money should NEVER be a preventing factor. Not only are we hosting our own scholarship, for five students offering $2,000 each, but we put together these handy dandy tips to helping with those tuition costs. If you’re a student nervous that you can’t afford school, you aren’t alone, research shows that the average need-based scholarship or grant award is $13,569. That’s a lot of money, especially for a recent high school graduate! But don’t worry, help is out there and just a little bit of work in relation to the tuition credits earned can go along way in deflating those dollar signs! My bet is you found AT LEAST ten scholarships you qualified for. Great, before you apply, lets first go over a few tips to follow in making sure your application is one that stands out among the rest! Stay organized! Once you see how many scholarships you are eligible to apply for, add all deadlines to your calendar and make sure you get all the forms and requirements submitted on time! Seek a second eye! Having others check over your work can give you new insights into making your application one to remember. Read directions. Every scholarship has its own set of requirements , and although you may be using a lot of the same content across the board, not all requirements are the same. Don’t miss the opportunity tuition credit because you missed a step in the process. Brag a little! Judges want to hear all about the great things you have done! Include relevant activities and honors that make you a winning applicant! If you don’t tell them, how will they know? Let go of the nerves! Don’t be afraid to apply for a scholarship. If you fit the requirements it’ your job to take advantage of the opportunity with confidence! 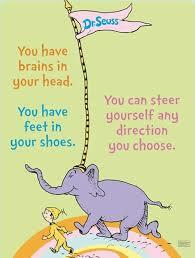 As Dr. Seuss says, “YOU are the one who will decide where to go!” Don’t be afraid of college and how you will get there. Take every opportunity as it comes and each semester at a time.